Kia's TV advertising campaign for the all new Telluride SUV would have you think that its customers like to scare bulls by kicking up clouds of dirt down on the farm. They show the Telluride ripping up pastureland with sideways drifts dramatic enough to panic the livestock. Similar print ads depict the new Telluride blasting out of sand traps so strenuously that Kia's lawyers are forced to note in fine print: "Additional sand added for effect." Well we didn't scatter the farm herd during our week with the Telluride, nor did we use it to conquer Baja. Rather, we spent a rather sedate week at the helm of Kia's finest SUV offering to date. The top line, AWD SX model carries a base price of $43,490. With the addition of a $2,000 SX Prestige Package, our test Kia tallied in at $47,255. 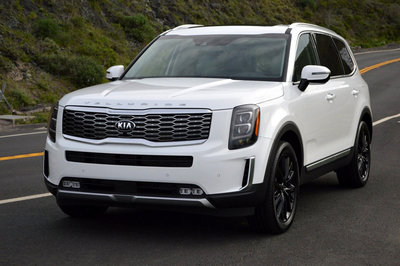 While that might seem expensive for a Kia, in the grander scheme of things, the new Telluride is a fantastic bargain. 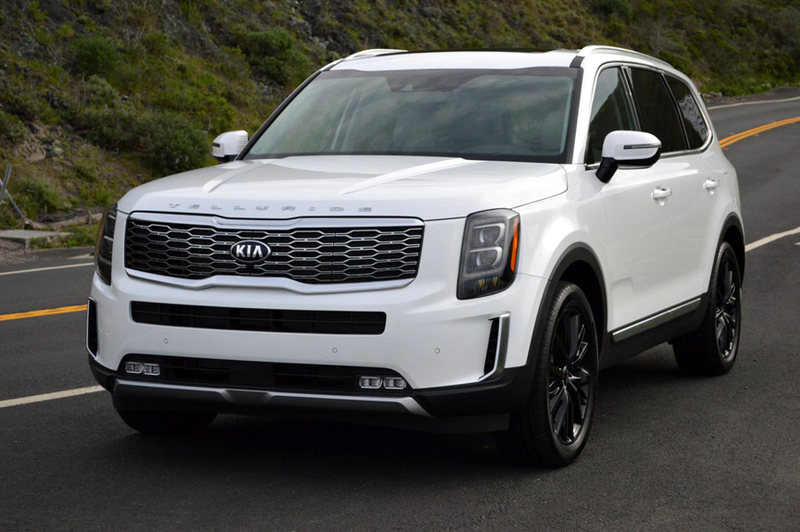 Of course, you can't beat the deal that Kia delivered at their recent LPGA golf tournament in Carlsbad, CA, where the company gave away not one but two Tellurides - one for a hole-in-one, the second to the winner of the event. The day after that event concluded, a test Telluride magically appeared in my own driveway. It looks even better in person than it did on the tube. For such a large vehicle, Kia designers and stylists have managed to minimize its bulk very effectively. Not by coincidence does this vehicle possesses the visual balance and athletic grace of a Range Rover. 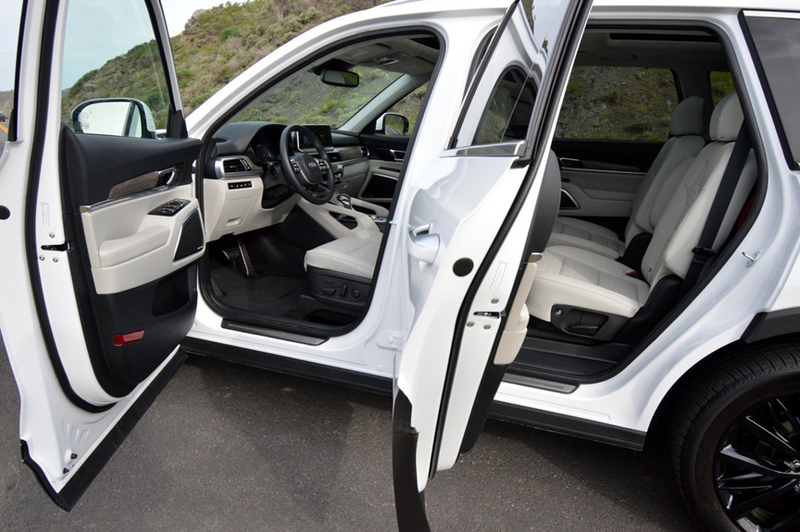 The Telluride's interior lives up to the extravagant promise of the exterior. 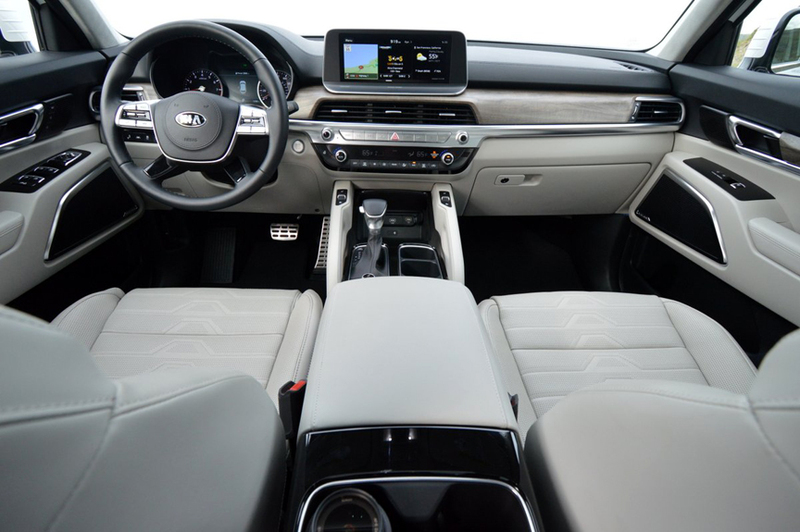 Kia's choice Nappa Leather, matte finished barn wood dash inserts, and elaborate W-stitched seating surfaces impart a quiet elegance to the interior. The subdued but effective exterior styling perfectly complements the restful elegance of the interior. Although we spent most of our time behind the wheel, we also had a chance to assess the rear accommodations during a short hop in one of the second row captain's chairs. The ride in back is convincingly luxurious thanks to erectable privacy screens, fold-down arm rests, individual temperature and fan adjustment provisions, and spacious leg stretch room. All in all, passenger status in the aft compartment is absolutely first rate. There's even a 110 volt rear inverter next to one of six USB ports scattered throughout the cabin. For easy conversion of the rear seats to storage use, Kia provides one touch slide and fold for both captain's chairs. A third row of seats is a first for any Kia SUV. When the second and third rows are folded flat, the interior of this bus yields 87 cubic feet of storage space. The all-wheel-drive version of the Telluride weighs in at 4,482 pounds. With a 3.8 liter V6 producing 291hp, the power-to-weight ratio is rather modest, at 15.45lbs. per horsepower. Tow rating is 5,000 lbs. The SUV's V6 is best when carefully managed by the manual mode gate available from the 8-speed automatic gearbox. If you choose the right ratio, the Telluride jumps forward with authority. But if you just leave the transmission in Drive, you're likely to endure rather more leisurely performance when you stomp the throttle. Paddle shifts are not available on Telluride. But Kia does offer sportier performance by providing 3 driving mode choices (Smart, Eco and Sport). If you select SPORT mode, the vehicle automatically adjusts steering effort and transmission control logic for "enhanced driver performance." The quartet of 20 x 7.5J inch black alloy rims which grace the SX model are shod with premium quality Michelin rubber: 245/50R20 Primacy Tour tires with a long life treadwear rating of TW 540. Not only will these Michelins last, they also provide excellent cornering bite. 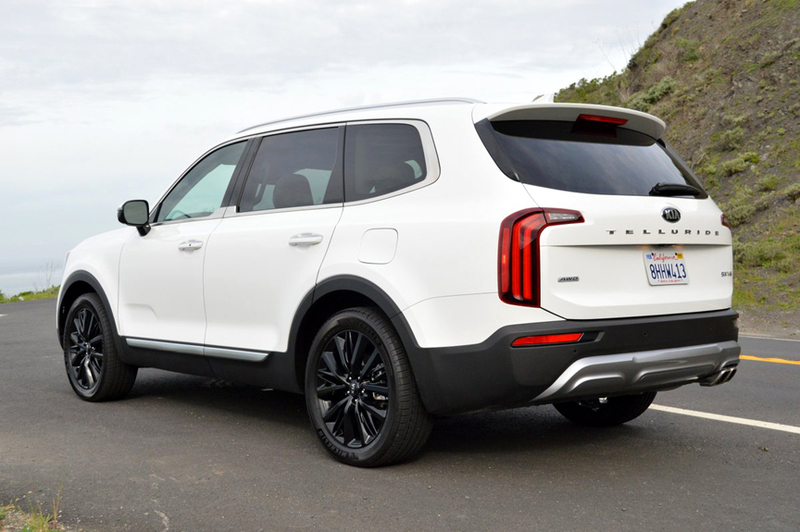 The Telluride may be big, but it never feels clumsy or unwieldy from the driver's 12 way adjustable, heated and cooled, glove leather soft seat. Four levels of Telluride are offered, with the entry level models dubbed LX, S, and EX. The SX AWD version tops the model line. Here are the extra features you get over and above any other Telluride when you opt for the SX AWD: 20" black alloy wheels, LED low beam and fog lights, fixed glass rear sunroof, 2nd row captain's chairs, memory driver's seat and outside rear view mirror, Harmon/Kardon surround sound audio, and park distance warning (front). The SX Prestige Package furthers the ante by providing Head-Up Display, 110V Inverter, Nappa Leather, Heated and Ventilated 2nd row seats, premium cloth headliner and visors, and rain-sensing wipers. In other words for two grand more on this Kia, you get what would cost you about 20 grand extra on a comparable German SUV. So I'll take my 3 row SUV from Kia South Korea, thank you.